Francis Edwin John Rowles, known as Frank, was the second son of Edwin John Rowles and Ellen Mary née Coole, his elder brother being Richard William. The Rowles had been a sea-faring family for generations but Edwin was unfortunately drowned when his ketch went down in December 1910 during a gale. In February 1913, at the age of 16, Frank sailed from Liverpool to Canada on the RMS Victorian with the intention of being a farm labourer. His initial destination was Winnipeg, Manitoba, but family members believe that he lived rough and moved from place to place finding work scrub-clearing, on sheep farms and killing the rabbits that were decimating the crops there. On 29 January 1916 Frank attested for the 129th (Wentworth) Battalion of the Canadian Expeditionary Force at Dundas, Ontario, declaring that he was in farming and resident in Sheffield, in the same province. Frank gave his place of birth as Clonakilty, County Cork, Ireland, which is at variance with other records, and a date of birth some two years earlier. 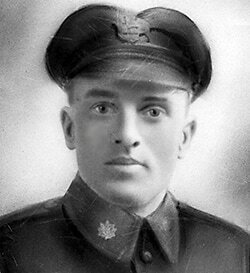 His battalion sailed to England in August 1916 and fought as part of the Canadian Corps on the Western Front. It is recorded that the Canadians were one of the most effective fighting forces in France, and were referred to as 'stormtroopers' by the Germans. Frank’s service is commemorated on the plaque in Frampton Village Hall. His future wife, Kathleen Doris Latty, emigrated to Canada in June 1920 and they were married at Galt, Waterloo, Ontario, on 25 March 1921; Frank was working as a machinist. They had two daughters, Diana Kathleen and Betty Joyce and the family visited Frampton in March 1932, sailing from New Brunswick to Liverpool on the SS Montclare. Francis Edwin John Rowles died in 1979, and was buried on 20th April at the Veterans' Cremation Lot of Woodland Cemetery in Hamilton, Ontario, Canada.